A hundred wines by the glass and Prime steaks are part of the appeal of this chain offering fine dining and a comfortable, casual lounge. 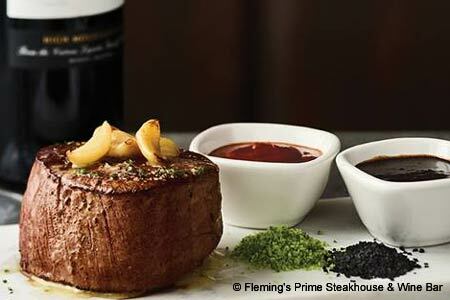 : This steakhouse chain distinguishes itself with its top-quality meats and notable wine program. The USDA Prime hand-cut beef includes rib-eyes, filets and New York strips, all seared by intensely high-heat cooking, for the signature steakhouse outer crust. Decadent sides run to chipotle cheddar macaroni and cheese and you'll find the classic steakhouse chilled wedge of iceberg lettuce with grape tomatoes, red onion and blue cheese dressing. Seafood, too, is well thought out, be it North Atlantic lobster tails or tuna mignon with tomato-sherry vinaigrette. The wine list features numerous hard-to-find American boutique wines as well as renowned national and international labels, with 100 wines by the glass, and an 80-label reserve list. Finish with a familiar dessert: cheesecake, chocolate lava cake or crème brûlée. For those in need of specialized menus, Fleming's has low-sodium, low-carbohydrate, and heart-healthy choices as well as a gluten-free menu. Perfect for the after-work crowd, the “5 For $6 ’Til 7” bar menu features five appetizers, five premium cocktails and five wines by the glass---each priced at $6 and served nightly until 7 p.m.